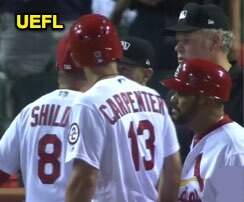 HP Umpire Will Little ejected Cardinals 3B Matt Carpenter and Manager Mike Shildt (strike three call; QOCY) in the bottom of the 7th inning of the Brewers-Cardinals game. With none out and one on (R1), Carpenter took a 2-2 knuckle curve from Brewers pitcher Corey Knebel for a called third strike. Replays indicate the pitch was located over the outer edge of home plate and at the midpoint (px -.900, pz 3.631 [sz_top 3.49 / RAD 3.613 / MOE 3.696]), and that all other pitches during the at-bat were properly officiated, the call was correct. * At the time of the ejections, the Brewers were leading, 7-4. The Brewers ultimately won the contest, 12-4. These are Will Little (93)'s eighth and ninth ejections of 2018. Will Little now has 15 points in the UEFL Standings (7 Prev + 2*[2 MLB + 2 Correct Call] = 15). Crew Chief Ted Barrett now has 8 points in Crew Division (6 Previous + 2*[1 Correct Call] = 8). This pitch was located .168 horizontal and/or 0.78 vertical inches from being deemed an incorrect call. This is the 176th, 177th ejection report of the 2018 MLB regular season. This is the 86th player ejection of 2018. Prior to ejection, Carpenter was 0-3 (2 SO) in the contest. This is the 72nd Manager ejection of 2018. This is St. Louis' 5/6th ejection of 2018, 3rd in the NL Central (CHC 10; MIL 9; STL 6; PIT 4; CIN 3). This is Matt Carpenter's 2nd ejection of 2018, 1st since Sept 9 (Lance Barrett; QOC = N [Balls/Strikes]). This is Mike Shildt's 2nd ejection of 2018, 1st since Sept 9 (Lance Barrett; QOC = N [Balls/Strikes]). This is Will Little's 8/9th ejection of 2018, 1st since August 31 (Rick Porcello; QOC = Y [Balls/Strikes]).